A look at our country house loose covers. 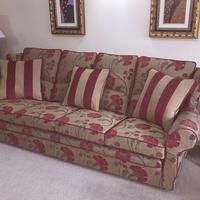 This beautiful old double drop arm sofa fitted with tailored loose covers. Are you looking for traditional country house loose covers. Eeze Covers can create the look you require. We have fitted covers in many country house retreats and given a new lease of life to lots of furniture. Alternatively some customers prefer no valance and instead opt for our Shabby chic style finish. Whatever your requirements Eeze Covers have the answer, it's what we do and we have been making tailored covers for over 35 years so you can rest assured you are in the right hands. Our service is available throughout the Uk, we even send covers throughout the world to customers who use our "copy cover service"
Basically they send in their old covers and we strip and replicate them. Even if they have shrunk we can use measurements and photos to get a professional finish. Loose covers makers are slowly diminishing and there are not many professionals still around, luckily we are still here and intend to be for hopefully many more years. Why not order your free loose cover fabric samples here NOW!